My first professionally-built gaming PC was a Maingear X-Cube, a charming little black box filled with joy and wonder. 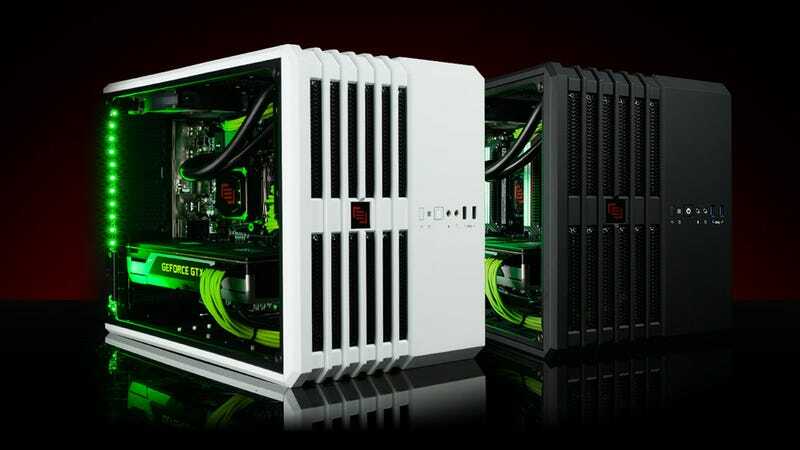 It looks almost nothing like the younger, sleeker models Maingear's just announced. They've come from the future. My X-Cube has no glowing window, unless you counted the flickering of the motherboard network port light through the empty five and a quarter inch bay in front. It had no water-cooling, but it did have soda-failing. And you could turn it on its side, just like the new model, but it wouldn't look cool. It would just sit there helplessly, making plaintive beeping noises. Ah, here it is. I take it back. It's almost entirely the same thing. Is it odd that one of this new case's most attractive features is the ability to turn it so the lighted window is at the top? I always wind up with the window facing away from me on my desk. This one gazes up my nose lovingly, and would serve as an excellent battleground for futuristic action figures. Dimensions: (W)10" x (H)12.5" x (D)15.5"
My original X-Cube has been sitting in a corner of my dining room since we moved into the new place several months back. The plan was to put a new hard drive in it for my sister, but it turns out she doesn't deserve a new hard drive. Maybe I'll fix it up for the kids, so one day we can all reminisce about how much we loved its stupid face.